Texas Hold’em Live is a premium live dealer game from leading live software developer Evolution Gaming, packed with bonus bets and customisable features. Read on to find out how to play live dealer Texas Hold’em online. As of September 2017, Australians are no longer permitted to play at online casinos, but read on if you are located outside of Australia and would like to know more about this blackjack variant. 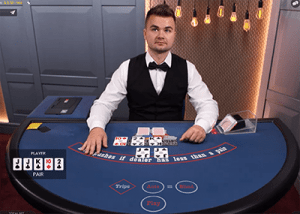 Evolution’s Ultimate Texas Hold’em follows the classic rules of Texas Hold’em poker, the major difference being that you play against the house instead of against other players. Because of this, Ultimate Texas Hold’em allows an unlimited number of punters to play at the table at once, so you can get in on the action at any time. The aim of the game is to beat the dealer’s hand by getting the best possible five card hand. The game uses a standard 52 deck of cards, excluding the jokers and the cards are shuffled after each round. Sign into your account and make a real money deposit. You’ll typically find Evolution Gaming’s Ultimate Texas Hold’em under the ‘Live Dealer’ category. 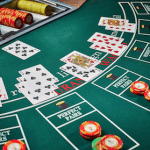 Although real money bets are required to play, as long as you have a registered account with the casino you will still be able to sign in to watch how gameplay in live Texas Hold’em unfolds. At the beginning of the next round, place your bet by moving a betting chip to the ‘ante’ spot on the table. The dealer will deal two face-up cards to you and two face-down cards to themselves. After a short pause, the dealer will deal three face-up cards in the centre of the table, which become the community cards (known as “the flop”). After another short pause, the dealer will deal two final community cards (known as “the turn” or “the river”). During the short pauses, click the buttons to decide whether to play or check. If you choose to play, use the two cards in your hand and the community cards to comprise the best possible five card poker hand. If your final hand is of higher value than the dealer’s hand, you automatically win and cash is credited to your casino account. Ultimate Texas Hold’em live comes with a theoretical return to player of 96.50%. Minimum bets start at just $0.50, with maximum bets capped at $500. This premium live dealer game also allows the player to fully customise video and audio, while also providing an optional chat function where you can chat with players from all over the world to maintain the social elements of playing poker in a land based casino. Ultimate Texas Hold’em offers the option of an additional Trips side bet. If you choose to add this side bet, it must be placed before the round commences. A bet on Trips is that your final five card hand is a Three of a Kind or better. 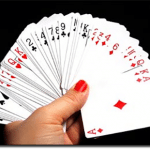 Royal Flush – a straight flush involving the Ace, King, Queen, Jack and 10 of the same suit. Straight Flush – a hand containing five cards in sequence, all of the same suit, e.g. nine, eight, seven, six and five hearts). Four of a Kind – a hand containing all four cards of one rank and any other card. For example, four Jacks in your hand would be four of a kind. Quads with higher ranking cards defeat lower ranking ones. Full House – a hand containing three matching cards of one rank and two matching cards of another rank, e.g. three queens and two fives. If both the player and the dealer have a Full House, the one with the higher ranking three cards wins. Flush – a hand containing five cards of the same suit, but not in sequence, e.g. five hearts of any value. Straight – a hand containing of sequential rank in at least two different suits, e.g. seven, six, five, four and three in two suits or more. Three of a Kind – a hand containing three cards of the same rank and any other two cards, eg. four Queens. Two Pairs – a hand containing two cards of the same rank, plus two other matching cards of the same rank, e.g. two tens and two kings. Pair – a hand containing two cards of the one rank, e.g. two Queens. International players will find a large selection of Evolution Gaming’s live dealer blackjack games available. Sign up to play Evolution Gaming’s live dealer suite at Guts Casino today to get a 100% matched deposit welcome bonus and 100 free spins to use on selected games.